Sprint has made the EVO View 4G update we told you about earlier official, with a press announcement that gives a bit more detail about what to expect. Besides the normal Honeycomb features, and the disabling of the capacitive buttons, the 3.2 update for the View also supports system-wide support for HTC Scribe -- including document signature capture from ActSoft. We've got the press release after the break. And do note that your home screens will be reset. Bummer, but so's not having Honeycomb. What if you failed to heed the warnings and tried to update your rooted S-Off EVO View and now have a lovely brick? Our forum developers once again have the situation covered with a short post explaining how to get out of the bootloop, get recovery back up and running, and restore an older back-up. Much better than panicking at 2AM and waiting for the battery to die. Hit the link to have a look. HTC EVO View 4G™ will be upgraded to Android™ 3.2, Honeycomb, with a maintenance release that is available for download today; Honeycomb is the version of Android designed specifically for tablets. Tap OK to download and install the update. You will not be able to use your device during the update. Once the download is complete, your tablet may power off and back on to complete the software update. The status of the download can be checked in your task bar. Verify the software is updated by going to Menu>Settings>About Tablet>Software information. The upgrade will also be available in 2012 through an over-the-air update from Sprint. The notification will let users know the update is available and provide the simple over-the-air download instructions. Due to the unique structure of the Honeycomb layout, customers’ personalized widgets and screen setup will not remain after the upgrade. The device will revert to the out of the box home screen layout. Wallpapers, Widgets, Application shortcuts personalized by the user have been resized for optimal viewing and will need to be re-established. Additionally, some third-party apps may not work with Honeycomb, a tablet specific operating system. We recommend users remove the application, and check Android Market™ to see if an updated application is available, or contact the application provider. 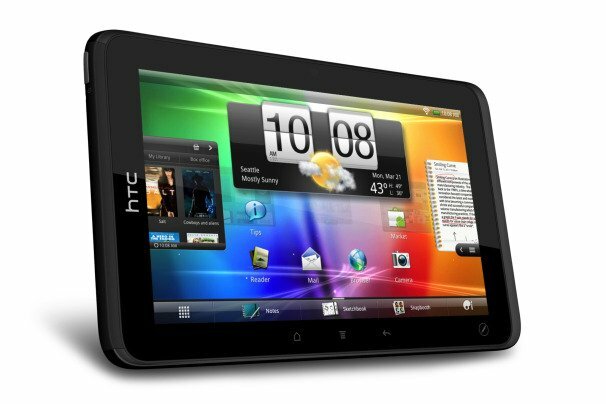 HTC EVO View 4G brings the best of the EVO experience to a tablet design with a 7-inch touchscreen, 1.5GHz Qualcomm Snapdragon processor and latest version of HTC Sense for Tablets. As the perfect combination e-reader, media player and portable computing device, HTC EVO View 4G offers a premium entertainment experience with HD-like quality video and a rich web-browsing experience with the ability to browse the web on Flash-enabled sites. Business users will appreciate the user interface enhancements, which allow the HTC Scribe™ digital pen to be used with all applications on HTC EVO View 4G and enable it to act like a stylus for navigation. This enhances productivity for employees who work with forms and fill out documents and allows users to check boxes, select radio dials, drop down menus and complete free text boxes. In addition to the stylus functionality, Document Signature Capture is now available for HTC Scribe and HTC EVO View 4G via ActSoft – other application developers to follow. Corporate IT departments will appreciate HTC EVO View 4G is now Sprint Data Link capable. This enhanced security feature enables greater control over the device, while ensuring secure connectivity to corporate network.